My last batch of Tomato Feta Muffins turned out so yummy that I decided to try the combo again. This time I added some sour cream to the mixture and they came out even BETTER! As usual I used Athenos Crumbled Feta (awarded "Best Feta" at the 2009 World Dairy Expo) and this time in Garlic and Herb flavor. Trust me, there's NOTHING like the flavor of this yummy combo! 1. Preheat oven to 400°F. Line 6 muffin cups with paper liners. 2. In a measuring cup, whisk together the butter, sour cream, milk and egg. In another bowl mix together the flour, sugar, salt, baking powder and baking soda. Stir in wet ingredients just until combined. Stir in tomatoes and cheese. 3. Fill muffin cups. Bake for 15-20 minutes, until lightly browned on top and toothpick inserted in the middle of a muffin comes out clean. I FINALLY Made Mini Cheesecakes! Emeril's Essence is PERFECT for Blackened Catfish! Who Knew You Could Make Muffins From Pancake Mix? A New Favorite Breadstick Recipe! 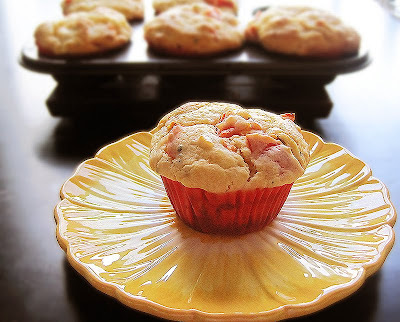 Tomato + Feta = Yummy Savory Muffins! I FINALLY Found Garam Masala! Cream Cheese is Not Only Good as a Spread! You Won't Find THIS Loaf of Bread in a Store! Cherry and Pork, Not Traditional but YUMMY! Taco Supreme + Mac and Cheese? Saturday Afternoons were Made for Panini! Funny Movies Make Us Want Pizza! The Secret to Perfectly Cooked Lamb is Braising! What's Better Than Pineapple Fried Rice? Guys Fieri Has Done It Again! Wish We Were Still in SoCal! Pulled Pork Enchiladas Take 2! Pineapple + Butterscotch = The Perfect Combo! Not Too Pretty but Sure Was TASTY! Another Yummy Recipe from Sunny! Watching More Cooking Shows @ The Gym! Yes Meatloaf Can Be Asian! What's Cheesy, Meaty and SUPER Yummy? Muffins to Share with my Girls! I'm not a chef, a nutritionist or a personal trainer. I'm just an ordinary girl who's obsessed with working out and cooking! I began my journey with the gym at the age of 17, when I first discovered how good I felt after 30-60 minutes of cardio and weight-lifting. I LOVE being at the gym but I also enjoy doing Taebo and Pilates at home once in a while. I work out 7 days a week (unless I'm REALLY sick), and I always feel GREAT afterwards. Exercise really is the perfect hang-over cure!